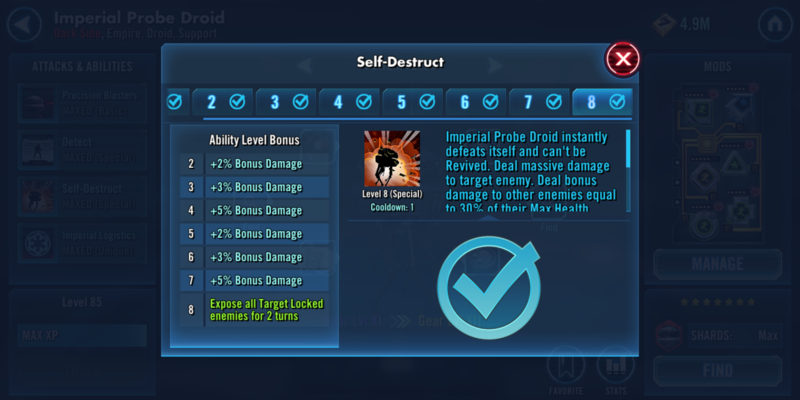 So with IPD's Self Destruct dealing damage, it can instantly defeat itself and then deal massive damage to thr target. However when you use it on raid bosses it does nothing. But what im curious about is why? Darth Nihilus can use Annihilate as many times as he can till enrage or the raid is over, dealing 99,999 damage. So why does IPD not get the same thing, but deal some increased damage since it would be a one time use? Anyone have thoughts as to why that ability has the same effect in a raid that Magikarp's splash does in Pokemon? More problematic is the fact that there are many characters that can take 99,999 damage without even batting an eye. Raid bosses are immune to massive damage. Since Nihilus does instant death instead, it’s coded differently and has a different specific effect on raid bosses. I think they should definitely code IPD to do a one-time 99,999 damage after self-destructing on a raid boss. Even 50 players in a raid would only do 5M total, which is about 10% of one phase of the heroic sith raid. Not going to break anything. The only "massive damage" I can think of that might be abused by this is Savage - put him in vs a raid boss below 50%, and he'd score 100k every time his special is up. In p3 str Asajj can quickly hit for well over 100k on her basic so I don’t think that giving Savage 100k on his special would be problematic. Well im only referring to raid bosses. And in the description it does say that IPD deals massive damage to target and an additional 30% damage of their max health to all other enemies. So im just curious why nihilus can do 'massive' damage in raids (coded differently so he can still use his ability but not defeat a raid boss like he does players or PvE enemies). And savage does still have the ability to use his Overpower in raids, which is coded differently to be able to use on raid bosses too. Someone already said- DN doesn't do massive damage, he instantly defeats. Instant defeat works differently than massive damage for raid bosses.